Adult Swim is moshing its way around the country with an immersive, fan-centric 13-city metal "thrash-tastic" tour featuring Exodus and Municipal Waste in support of the new season of its animated series Mr. Pickles. 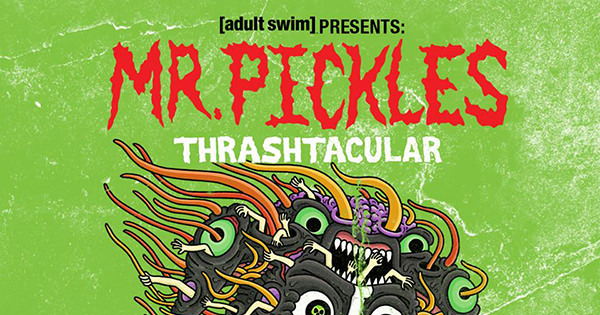 Along with enjoying face melting guitar riffs, fans attending the Thrash-tacular Metal Tour can take photos in the Mr. Pickles hellacious dog house, purchase exclusive Mr. Pickles merchandise and receive free Adult Swim swag. The new music tour continues Adult Swim's commitment to bringing vibrant and impactful experiences directly to its fans. Exodus' Gary Holt states, "Super excited to hit the road again with our good bros in Municipal Waste for the Adult Swim's Mr. Pickles Thrash-tacular tour! This will be a thrash extravaganza at its finest! Can't wait!"